Update: Avaira Lenses have been discontinued by the manufacturer as of Jan 1 st 2017. Lenses can still be ordered if your power shows in the drop down power box, as we have those in stock. 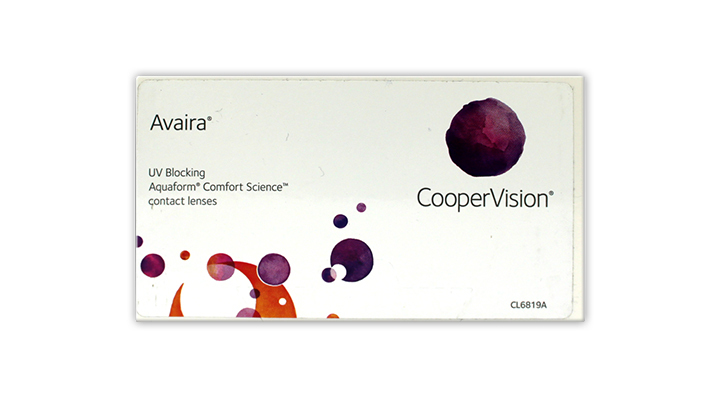 We recommend the new advanced Avaira Vitality lens from Coopervision - the best of Avaira, plus superior comfort, vision quality and enhanced UV blocking - all for the same price. Avaira Soft Contact Lenses by Coopervision features a naturally wettable silicone material that allows the lens to stay moist without surface treatments, additives, or wetting agents. Its natural wettability is made possible by the same unique Aquaform technology found in CooperVision’s Biofinity® monthly replacement silicone hydrogel contact lenses. Aquaform technology delivers optimal comfort and minimizes deposits, while also allowing a high level of oxygen to pass through the lens. CooperVision’s Avaira is manufactured from enfilcon A, and features a UV blocker and CooperVision’s proven aberration neutralizing system™. This system uses unique aspheric optics that enhance vision by minimizing spherical aberrations inherent in both the lens and the human eye. Avaira also utilizes an optimized back surface and rounded edge design, which allows for better comfort. I switched to these lenses from the Focus lenses and haven't looked back! I found them to be very comfortable, they don't appear to dry out as easily as other lenses even when the conditions aren't ideal for lense wearers. Highly recommend them to those looking for an alternative in comfort and durability. Out of the 3 pairs 1 pair didnt last the day before i had to take them out the other 2 pairs didnt last the month, probably 15 - 20 uses as i dont wear them every day. Very clingy and streaky and often hard to take out at the end of the day because they was stuck to my eyes. These are basically the upgrades to biofinity and are much much more comfortable than biofinity lenses!